Longtime AFC West rivals will open Week 12 of the 2014 NFL season as the Oakland Raiders will host the Kansas City Chiefs on “Thursday Night Football.” The playoffs are in sight and office pools everywhere are coming down to the wire. 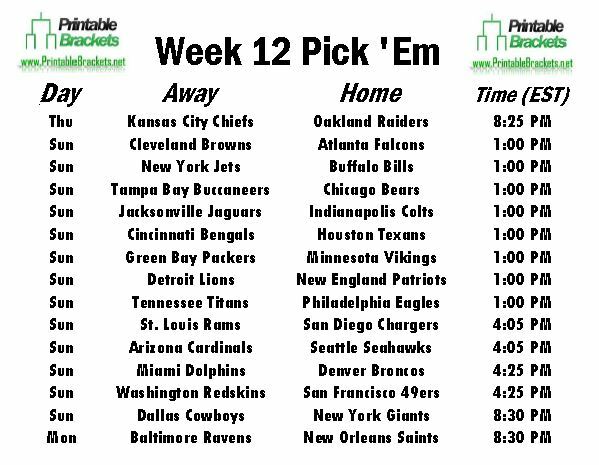 Get a printable NFL Pick Em Week 12 sheet for free compliments of Printablebrackets.net. Few teams have more of a longer-running rivalry than the Chiefs and the Raiders. In 2013, the Chiefs dominated both meetings with their AFC West counterparts. After notching a 24-7 home win in Week 6, the Chiefs cruised to a 56-31 victory in Oakland in Week 15. However, the Raiders won both meetings with the Chiefs in 2012. There are a total of eight early Sunday games on the NFL pick em Week 12 sheet. The early action is headlined by a meeting between Calvin Johnson and the Detroit Lions and Tom Brady and the New England Patriots in Foxboro. The Green Bay Packers will also renew their rivalry with the Vikings in Minnesota. An NFC West showdown highlights the late action on the NFL pick em Week 12 sheet as the defending champion Seahawks will host the Arizona Cardinals in Seattle. The Cardinals were the only team that beat the Seahawks in Seattle last season. An NFC East affair is on tap in the nightcap, as Tony Romo and the Dallas Cowboys will take on Eli Manning and the Dallas Cowboys on “Sunday Night Football”. The Week 15 schedule wraps up with Drew Brees and the New Orleans Saints hosting the Baltimore Ravens on “Monday Night Football”. Only two teams will get to enjoy their bye week in Week 12. The Carolina Panthers and the Pittsburgh Steelers have the weekend off. Week 12 marks the final week of bye weeks for the season.